The Navaho (SM-64) was one of three strategic surface-to-surface cruise missiles developed by the United States in the decade following World War II, the others being the Matador and the Snark. Built by North American Aviation, the SM-64 Navaho was an experimental supersonic intercontinental cruise missile with a design range of about 6,500 km (3,500 miles). When operational, it was intended that the Navaho would carry a nuclear warhead and have a combat range of about 8,000 kilometers (5,000 miles). The Navaho program began in 1950 and culminated in 11 launches from Cape Canaveral Air Force Station between 1956 and 1957. None of these was successful and the program was cancelled in 1957. However, a further five flights were commissioned to test technology and carry out research that would be useful in other programs. On one of these final flights, the Navaho achieved its best result – attaining Mach 3 and staying airborne for 42 minutes 24 seconds. The Navaho consisted of two parts, a liquid-fueled booster rocket and a cruise missile. The latter carried the warhead and was powered by a ramjet engines. 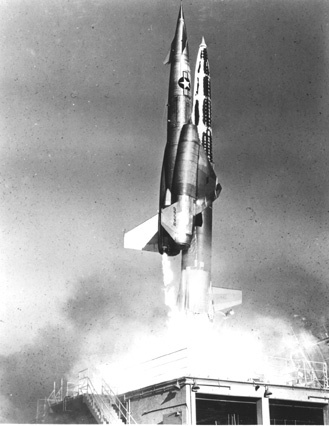 The booster accelerated the cruise missile to nearly Mach 3, at which point the ramjet engines were ignited and the booster was jettisoned. Although the Navaho program cost $700 million and resulted in less than one hour of flight time, it did significantly influence the development of large liquid-propellant rocket engine technology in the United States. From the Navaho was derived the engines for the Redstone, Thor, Jupiter, Atlas, Titan I, and Saturn I rockets. The Navaho program also led to fuel tank fabrication techniques, inertial and stellar navigation, and other technologies used in later vehicles. The inertial guidance system, for example, employed the first solid-state digital computer ever developed in the United States, and was later used as the guidance system on the first U.S. nuclear-powered submarines.